I am a professor and a newly minted pro vice chancellor and I have spent my entire research and working life with male bosses or supervisors. I have never reported to a woman. This phenomenon is particularly acute in the fields of science, technology engineering, mathematics and medicine (STEMM). It’s why more than 30 universities, six medical research institutions and four publicly funded research agencies have joined the Science in Australia Gender Equity pilot project (SAGE). Student completions and academic staff STEMM. The SAGE project involves both men and women, as all gender equity programs must. Gender equity is not only a problem for women, just as advances in gender equity are not only a blessing for women. Improving women’s status, workforce participation, legal protections, and physical security benefits the whole of society. There are many wonderful things that are positively correlated with increased gender equality. Men’s psychological and physical health improves and the gender gap in life-expectancy decreases. There is less domestic violence. Companies with more women on the board have higher financial returns and greater levels of innovation. Countries with greater gender parity have higher annual GDP. A study of 50 US states and 31 European countries found that, on average, men are also happier, they have better quality of life, spend more time with their friends and family and are less constrained by strict gender norms. Gender equality lifts us all. So for the good of us all, men and women must mainstream gender equity. This means building gender equality into every practice and process so that it becomes the new norm. Mainstreaming means shifting cultural norms and baselines, accepting that gender bias exists, encouraging discussions of gender inequity, speaking out against sexism and harassment, recognising and removing conscious and implicit bias, and weakening stereotypes. We all have a lifetime’s worth of experiences but depending on our background, those experiences may be quite different. This can become a problem if one dominant group holds most of the powerful positions. Men comprise seven out of eight of Australia’s current G08 university vice chancellors, 79% of our STEMM professors, 83% of Australia’s CEOs and about 88% of our learned Australian Academy of Science fellows. These powerful people – directors, professors, academy fellows – who are making decisions and defining merit; they can design out gender bias if they have the motivation to do so. Attaining that desire for change, in the face of resistance, may require some recalibration of their world view. This will be more difficult for people in positions of privilege for whom discrimination is less visible. It is not easy to reduce conscious or implicit bias but we can read studies that document gender bias and provide data to help us reset our baselines. We can take implicit bias tests online, we can replace intuition with formal analysis and slow down our decision-making to allow for considering bias. We can also surround ourselves with female mentors and colleagues so that we gain ‘outsider’ perspectives. Women will have diverse experiences and attitudes towards the gendered workplace. If we surround ourselves with women and we avoid the four Ds, set out below, we can help recalibrate our world view and break down stereotypes. Denial is the outright dismissal of the existence of inequity. Denial might be more common if you have never experienced that particular bias. 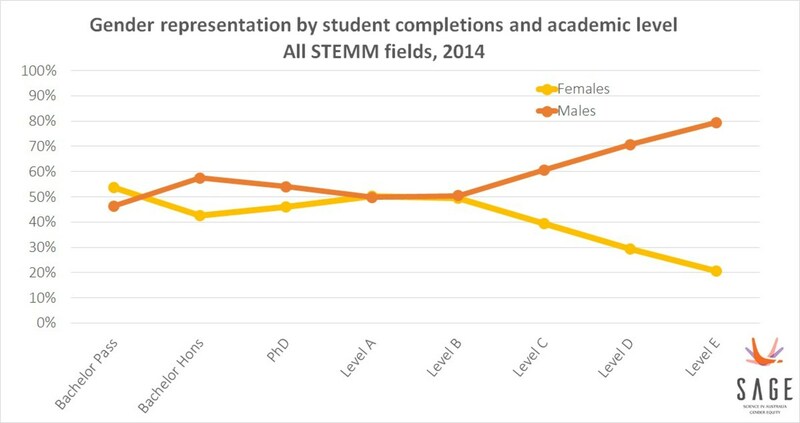 For example, one study revealed that male STEMM faculty members were less likely to accept evidence of gender bias. To mainstream gender equity, we need to avoid denial by first listening and accepting, in order to enable discussion. If we are listening to a first-hand account of bias then we must assist the person to find appropriate professional support. If we remain in doubt about the likelihood of bias, we can always look for empirical evidence of general patterns. We might even consider doing an analysis or experiment to test for discrimination ourselves. This is a difficult one. We develop a thick skin. So it is tempting to dismiss the worries of our juniors in whatever form the hierarchy takes. But people who experience inequity don’t always develop thick skins. They can experience real-time reactions and under-confidence resulting from a lifetime of exposure to biased evaluations and stereotypes. Mainstreaming gender equity into the culture of an organisation requires accepting the gravity of the situation as presented, and looking for solutions to problems even if we do not suffer them. If we find ourselves using the phrase “I’m sure they didn’t mean it that way” then we need to stop, reflect and reconsider our perspective. Again, it may take a conscious effort to accept that the inequity is real. A great example of this is the uncritical use of the term “merit”. People believe they are making judgements based entirely on “excellence”. But several studies show that men and women will judge CVs, papers, teaching and even student essays to be superior when labelled with a male name. Derailment happens when we are being empathetic or trying to get attention ourselves. We may listen to an example of bias and respond with the phrase: “Oh yes, but you won’t believe what happened to me…” This can, inadvertently, change the topic. If our own experience is less intense, and the consequences less severe, then our contribution may derail and diminish the discussion. We need to have these discussions about the serious issues of harassment and bias. If men and women are to mainstream gender equity, our heart must be in the right place and we must value fairness, but this will not guarantee success. We know we must work proactively to put systems and practices in place that reduce bias and promote equality and diversity. For the most part we already know what those systems and practices are. They are hardly rocket science. The rocket science is in learning to listen to very quiet voices; it is creating spaces for those voices at work. The rocket science is also recognising and addressing our own implicit biases and our own limited experience. They say that travel broadens the mind, so maybe what we all need to do is leave our comfortable universe and step into a female rocket scientist’s shoes.